Because life's too fun not to share. Leaving the expressway, Aomame sees a policeman in new uniform, with a new gun, and is informed that the changes occurred after a violent gun battle in the mountains, two years previously. And then she notices that there are two moons in the sky. Aomame is no longer living in 1984, but in the alternate year of 19Q4, where both history and the rules have changed – possibly enough to threaten her life. Tengo is a part-time tutor in maths at a Tokyo cram school. He writes short stories, meets his married lover once a week, and has no friends. His editor, Komatsu, convinces him to take part in an audacious deception: rewrite a potentially brilliant short story by 17 year old Fuka-Eri, and enter it in a prestigious literary competition, where it is guaranteed to become first famous, and then a bestseller. From here, events slowly spiral out of control. It becomes apparent that Fuka-Eri did not write the novel herself – she is dyslexic – and she did not submit it to the competition. She escaped from the Takashima commune seven years previously, and has not heard from her parents since. The tale of 1Q84 unwinds languorously, referencing its namesake, Orwell’s 1984, in the interpretation of thought crimes, and the use of controlling, omniscient authorities in a society for whom the notion of a Big Brother has become blasé and disinteresting. Musical and cultural references link the two separate characters, drawing together a story which might otherwise become dislocated. Characters are interesting, and the reader is drip-fed facts as they become relevant; there is no overwhelming deluge of exposition here. You will crave it, for the entire story, but Murakami dispenses it carefully, keeping you thirsty until the very end. 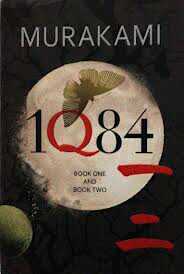 Having read it, I am very keen to move onto Murakami’s unexpected sequel, 1Q84: book three. My only objection to 1Q84 is that I think it moves past the institutionalised abuse of the children within the cult a little too quickly, but that in itself works well as the lens of narrative shifts focus. K.L gives 1Q84 4 out of 5 oddly recurrent themes. SPOILER ALERT! DANGEROUS WORDS AHEAD! I don’t know. You’ll finish it, and you won’t know, either. It’s why I have to read the third book… Murakami’s mind control is working well. This entry was posted in Fantasy, Fiction and tagged 1984, 1Q84, air chrysalis, big brother, fantasy, japan, Murakami, mystery, Orwell, the little people. Bookmark the permalink.